Tucked away in a small sleepy corner of California just East of the Salton Sea sits not just one but two of the most beautifully bizarre man-made areas I’ve had the pleasure of visiting. 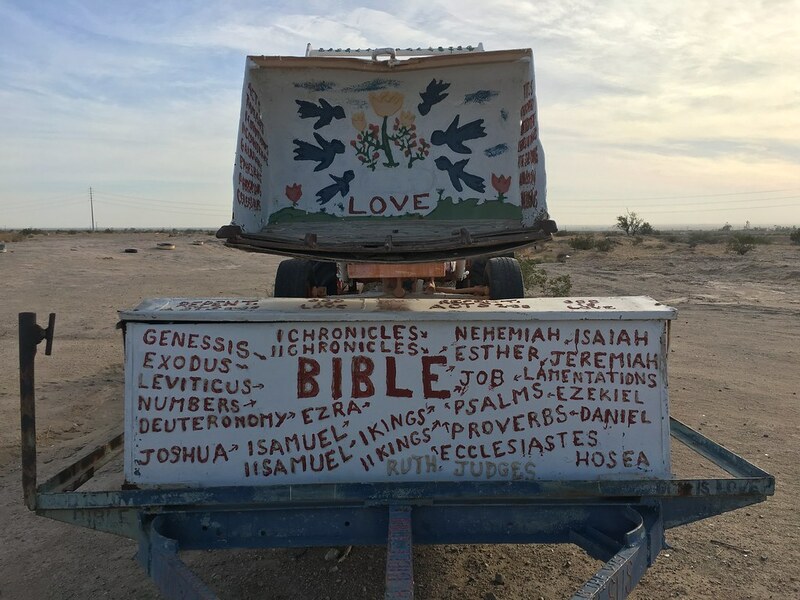 The stores and fables of Salvation Mountain and East Jesus have intrigued me ever since I moved to Los Angeles almost a decade ago, but it wasn’t until last weekend that I finally witnessed the oozing creativity for myself. One second, you’re taking a dusty road off the beaten path, in what feels like the proverbial middle of nowhere: you’re off the grid and surrounded by a sweeping desert landscape of BLM land with scattered mountain ranges. 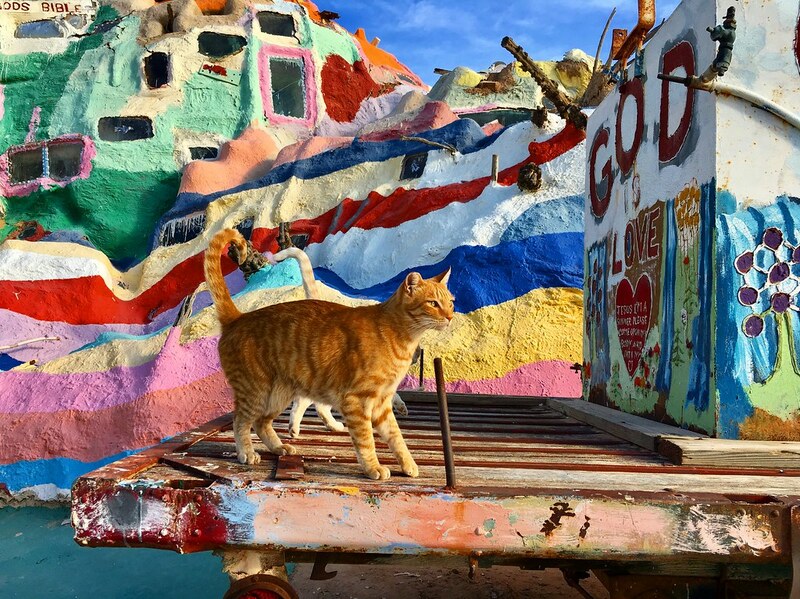 All of a sudden, you see it – and once found you absolutely can’t miss it: a brightly painted surreal scene that felt born of Dali and Dr Seuss. 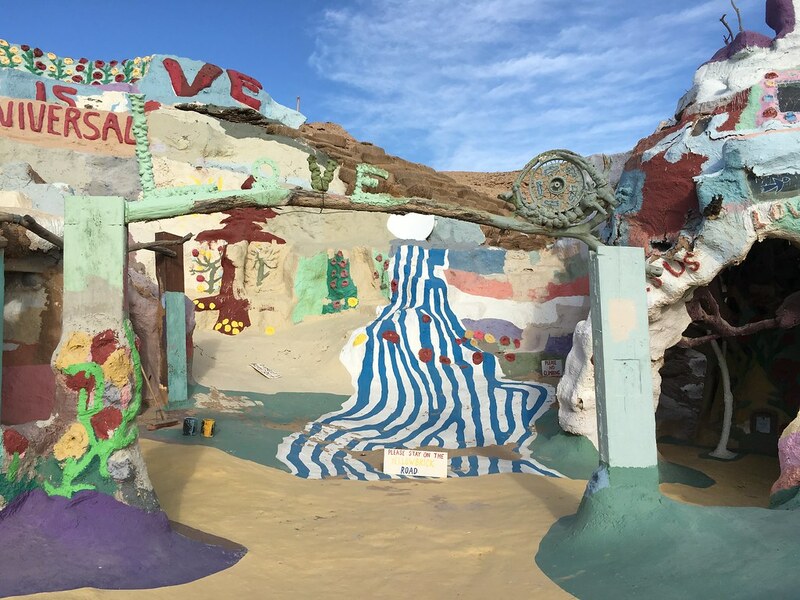 First created back in 1984, Salvation Mountain is an otherworldly artistic expression from area local Leonard Knight. Recognized by the Folk Society of America as a “folk art site worth protection” back in 2000, the mountain itself is ever evolving – with volunteers flocking to the mountain the first Saturday of every month with their buckets of paint, ready to pour themselves into Leonard’s vision. My personal favorite part? There’s cats – eight of them, to be exact, and they’re so freaking adorable roaming the yellow brick road. Let your wanderlust carry you to the top of the mountain, and don’t forget to take in the vibrant colors that are dancing around you. Saunter off to the right of the main hill, and you’ll find multiple nooks and chaotic crannies littered with bible verses, prayers, religious sentiment and offerings. 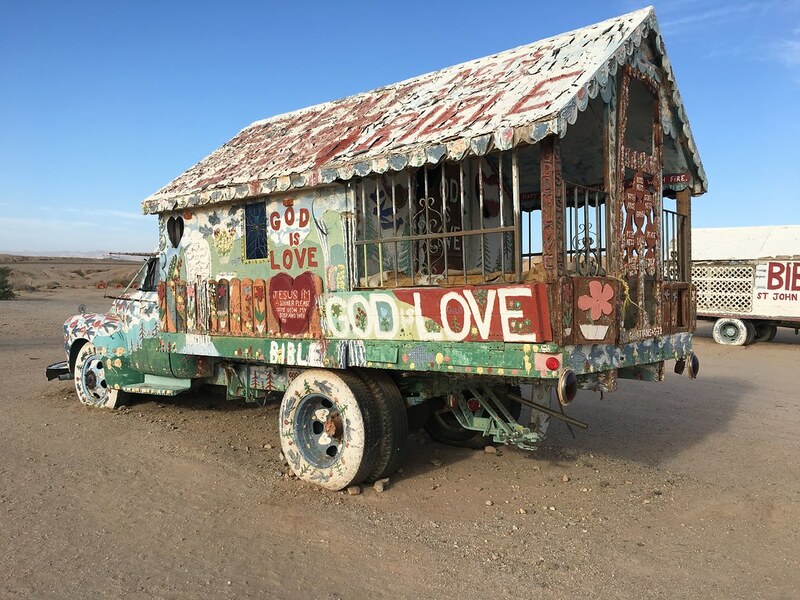 All around the outskirts of the mountain are refurbished cars, embellished with impeccable detail and design.If you couldn’t get enough of Salvation Mountain, just you wait until you get into Slab City and East Jesus. The best way I can describe East Jesus: think of it as a retirement center for Burning Man art, and maybe even burners as well. 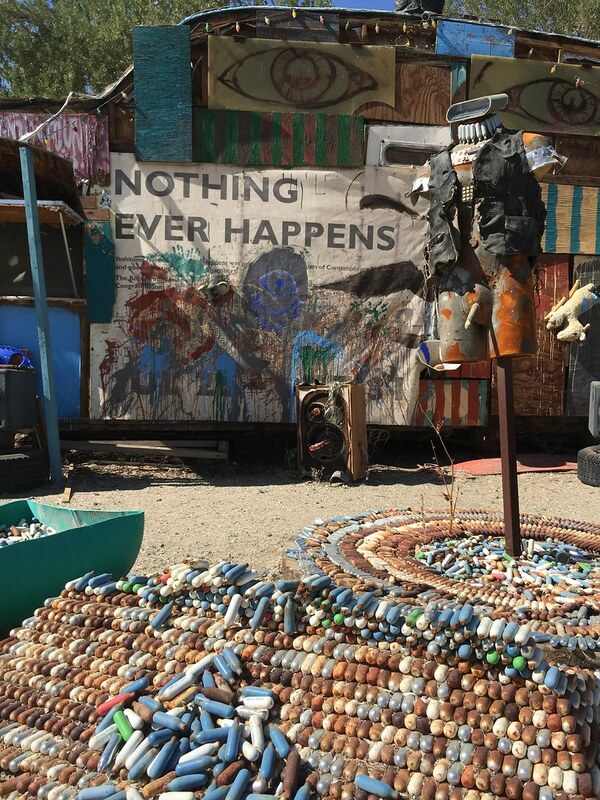 The area itself is so off the grid that one truly could create a year round community built on the ethos of Burning Man – and indeed, some have: Slab City itself is considered a sparse ‘snowbird’ community – no running water, no food, no amenities – meaning residents are forced to be radically self reliant within it. If it’s chaos, then it’s the most controlled version of chaos I’ve ever seen – there are blocks, addresses and streets, basic societal infrastructure…just without the rest of society. It really makes you think about the bare minimum you would need to be content, and how magically creative you could be as you create your own world. 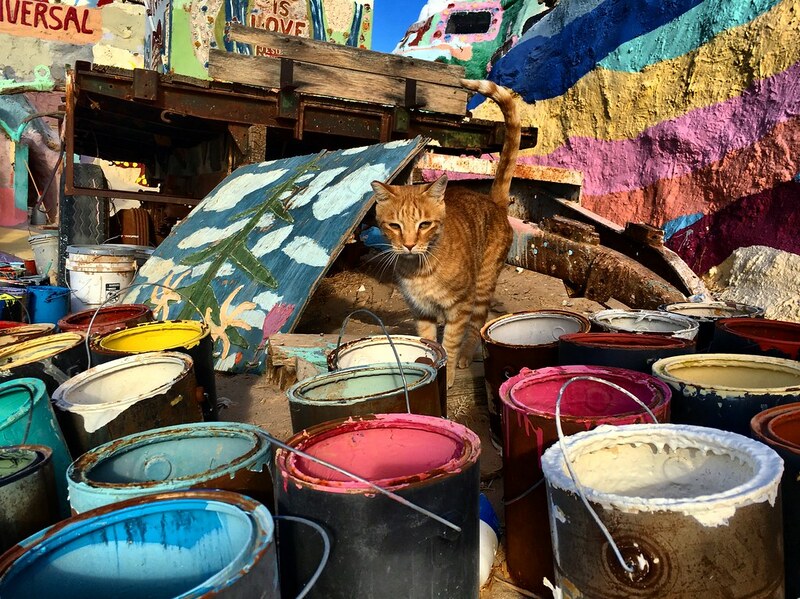 Built on top of a Camp Dunlap, a de facto military base that was dismantled at the end of World War II, Slab City was named for the literal ‘slabs’ that were left over – using them to create their city. Last, but certainly not least, my favorite part: East Jesus. I’m pretty sure I could get lost inside their art garden and I’m 1000% alright with that. 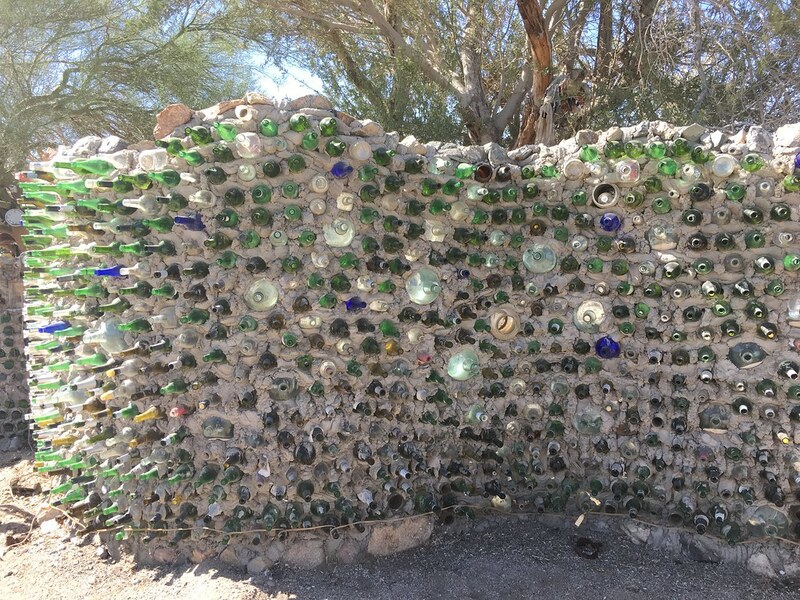 The art inside is made completely from repurposed and upcycled materials. Ever evolving and interactive, there’s treehouses to climb, outdoor bowling, the craziest sculptures built out of seriously who knows what, and so very much more. There’s not only something to look at around every corner, but something to make your head spin just a little bit, maybe even enough to spark a conversation with a stranger. 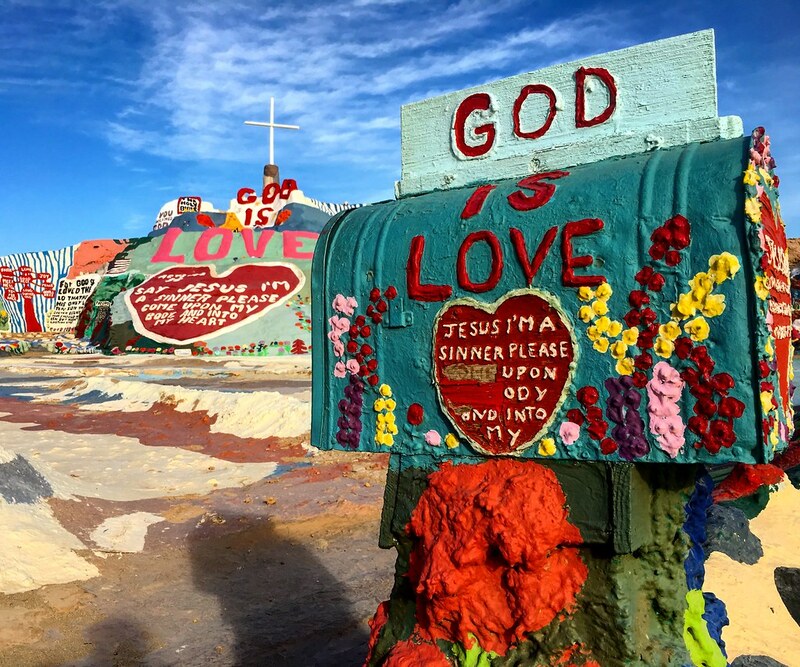 Hands down, Slab City, Salvation Mountain and East Jesus are roadtrip destination worthy of being on everyone’s bucket list. For more photos, head to my album here. For more, head to their socials – or just plan your next visit!